On September 7, 2017, the first meeting of the Working Group on Improvement of Water Accounting Quality and Accuracy was held in Almaty. The Group was established by the decision of the Interstate Commission for Water Coordination in Central Asia (ICWC) within the framework of the “Implementation Plan on strengthening ICWC activities in key directions” approved in 2014. The event was financed by the CAREC project “Promoting dialogue for conflict prevention related to environment, water nexus issues in Central Asia: Central Asia Water-Nexus Cooperation” with the support of EU. Sharing experience in water accounting in the Central Asian countries and BWOs. Discussing drafts of national and regional reports on water accounting and recommendations for its improvement. Identifying basic directions for further activity of WG. Mrs. D.R.Ziganshina (SIC ICWC) opened the meeting and informed on the mandate and tasks of WG. The participants got acquainted with Activity plan 2017 of WG approved by ICWC, based on which the agenda of the first meeting was defined. They approved the proposed agenda. In his opening speech Prof. V.A.Dukhovniy underlined the analysis of water losses in the Amudarya River showing that they increased twice. In 1990, water losses were estimated at 4.8 km3; today they amount to 10 km3. The situation in the Syrdarya River also changed in the last three years, with water losses recorded in places where they did not occur before. The reasons may be evaporation, seepage, and process losses. At the same time, he underlined that three-time measurements often do not record fluctuations of water discharge up to 180 m3 that occur in-between measurements due to releases of water from upper reservoirs operating in energy regime (for instance Uchkurgan hydroscheme along the Naryn River). Wider public involvement in water accounting, implementation of SCADA system, and adoption of irrigation water fees on volumetric basis are needed. Mrs. Imasheva spoke on water accounting in Kazakhstan. Particularly, she mentioned that Kazakhstan relied on the program of reconstruction of irrigation systems. So far, annual reports are prepared in TP-2 format. In Kazakhstan, scientific and production center “Su-Metrologiya” is responsible for certification and verification of gauging stations at the national level. Since October 2015, “Su-Metrologiya” acts as Metrological Service of “KazVodKhoz” at the Ministry of Agriculture of Kazakhstan and delivers services to water agencies and enterprises. 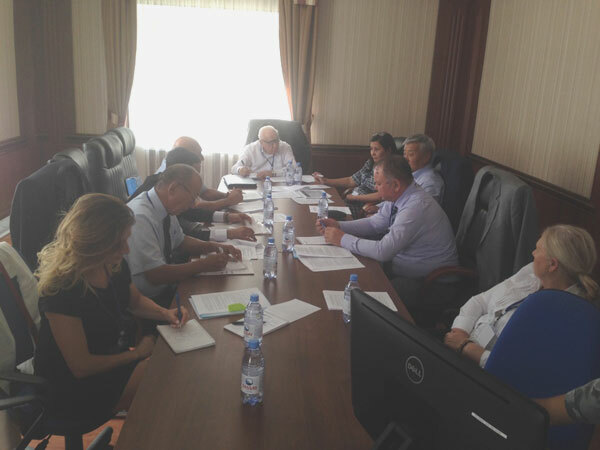 Director of “Su-Metrologiya” Mr. S.B.Seysenov informed on work carried out by the organization and existing problems. “Su-Metrologiya” is funded through contracts with water agencies. In total, the database of the organization contains information on 2,735 hydraulic structures, including 747 canals, of which 635 are registered. He also informed that recently many canals have been silted, covered with plants, and their performance has significantly deteriorated. Today no activities are carried out to improve their performance. The due time for certification of interstate gauging stations has already expired. The Coordination Metrological Center of the Interstate Commission for Water Coordination in Central Asia (CMC ICWC), located in Bishkek and responsible for this process, needs to be involved to certify and verify these gauging stations. “Su-Metrologiya” supervises over the time of verification of gauging stations along the main and inter-farm canals, as well as controls water use based on approved limits. Because of low salaries, there is fluctuation of personnel. 20% of staff does not have higher education. There are also problems with maintenance of equipment. Mr. Sh.Kuchkarov spoke on water accounting in Uzbekistan. Particularly, he mentioned that the Central Water Administration (CWA) carried out inventory of gauging stations; relevant database is being formed. Position of hydrometer expert is reinstated in each district. To certify gauging stations, training courses were organized with support of SIC ICWC trainers and the Agency for Standardization, Metrology and Certification of Uzbekistan. At the end of the training, certificates were given to hydrometer experts to conduct certification and verification of gauging stations. Similarly, UNDP allocated funds to train verification officers. Discussions are under way to reinstate the Basic Metrological Service (BMS), probably on the basis of the Scientific Research Institute of Irrigation and Water Problems (SRIIWP). It will be responsible for certification and verification of gauging stations at the inter-farm and interstate levels. Director of “Su-Metrologiya” asked about regulatory and methodological literature on construction and verification of gauging stations. Mr.Kuchkarov answered that this kind of literature is prepared in Uzbek language. Mr. M.Saparbaev informed about water accounting at BWO Amudarya. Particularly, he told that many gauging stations installed along the earthen channel were silted; repair and restoration activities were not organized. It is needed to recover their initial design profiles and pave slopes and canal bottoms with concrete. Gauging stations of “fixed channel” type need to be verified annually. Moreover, CMC ICWC should be involved in this activity. Now 187 gauging stations are installed on 430 hydraulic structures. In the Turkmen part, no balance gauging station is installed. There are no qualified hydrometer experts to continuously account water discharge. Due to siltation in canals, their discharge characteristics have error of 7-10% and more. Mr. L.Nazariy informed on water accounting at BWO Syrdarya. Particularly, he told that BWO was responsible for management of water resources, operation of hydraulic structures, ensuing limits of water supply to water user states in Central Asia, as well as bypass of water to the downstream of the Syrdarya River to ensure water to Prearalie and the Aral Sea. Totally, more than 200 hydraulic structures are on the balance of BWO Syrdarya, including 21 large gauging stations, head water intakes and interstate canals located along the Naryn, Karadarya, Syrdarya, and Chirchik Rivers, as well as Uchkurgan, Kuyganyar, and Upper Chirchik gauging stations, transboundary canals of interstate importance, such as Big Fergana Canal, North Fergana Canal, Dustlik Canal, Big Keles main canal, and Khanym and Zakh canals. BWO Syrdarya is responsible for accounting water withdrawal from rivers and canals on 445 points, of which 187 are gauging stations, including those of HydroMetServices and water agencies. BWO Syrdarya maintains information exchange with HydroMetServices, CDC “Energy”, territorial administrations, ministries, committees, and other agencies in the Syrdarya River basin. Increased trust of consumers to BWOs. BWO Syrdarya presented its needs in further capacity building, which would be detailed in the regional report. In conclusion, SIC ICWC expert on water accounting Mr. R.Masumov described technical details of SCADA automation system, principles of its operation, and required preparatory activities. Among foreign facilities for monitoring water level and discharge, he mentioned modern discharge meters which measure local velocity (Doppler Effect) with simultaneous measurement of water level (supersonic echo sounder). He presented technical parameters of discharge meters from South Korea. They are designed to measure water discharge in canals with both concrete and earthen channels with unstable cross section. He told on monitoring of water-related situation in South Korea, where all information on air temperature, humidity and surface water and groundwater is automatically sent through independent weather stations (600 pieces) to the unified dispatching desk serving to collect information and support decision making. He added that Korean autonomous units were installed at the head gauging station of the Tashkent main canal and at water offtake from the Tuyamuyun reservoir. During discussions, the importance to supervise water accounting by water users and communities was underlined. The participants highlighted the importance to resume automation process in the Syrdarya River basin, including downstream of Shardara, as well as to attract donors’ attention to the Amudarya River basin. They also discussed the need to share experiences and practices on water accounting at the national level. The positive experience of Kazakhstan was mentioned, where a specialized metrological service is operating. WG members would submit national reports on water accounting in their countries and recommendations for its improvement by October 1, 2017. Based on these reports, WG coordinator Mr. R.Masumov would prepare summary report by October 15, 2017 to present to ICWC members and Anniversary Conference of ICWC in November 2017 in Tashkent. To improve water accounting quality and accuracy, donors need to be involved to automate and implement SCADA system on the Syrdarya and Amudarya Rivers. SIC ICWC would inform WG member from Turkmenistan and ICWC members on the results of the meeting. The participants expressed their gratitude to the Executive Administration of IFAS in Kazakhstan and CAREC for their support in organization of the WG meeting within the framework of the International Scientific-Practical Conference “Transboundary Cooperation in Central Asia – Sustainability and Prosperity in the Region”.